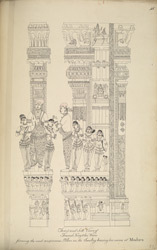 Pen and ink drawing of a column in the Pudu Mandapam at Madurai carved with the figures of Tirumalai Nayaka with his wives, from an 'Album of 51 drawings (57 folios) of buildings, sculpture and paintings in the temple and choultry of Tirumala Nayyak at Madura. c.1801-05', by an anonymous artist working in the South India/Madurai style, c. 1801-1805. Each picture is inscribed with a title and a number in ink. This drawing is of a carving that can be found in the Minakshi Sundareshvara Temple of Madurai. The complex contains two main shrines; one dedicated to Shiva and one to his consort Minakshi, an ancient local divinity. Each shrine is set within its own walled complex containing several subsidiary shrines, mandapas (assembly halls) and artificial pools. The construction of this temple-town was made possible by the wealth and power of Tirumala Nayak (1623-1659). He was the most prolific builder of a long line of Nayaka kings, a dynasty who ruled a large portion of Tamil country in the 16th and 17th centuries. The whole site, which mostly dates from the 17th century, is enclosed within a rectangular precinct which covers six hectares and has 11 huge gopurams or towers, the biggest of which mark four entrances from the four cardinal points. Set outside of the east gopura or entrance tower is the rectangular hall called Tirumalai's choultry or Pudu Mandapa. This hall was built by Tirumala Nayak between 1622 and 1633 and has pillars carved with life-size figures of Tirumala himself. In this drawing he is rendered in a very naturalistic manner surrounded by his wives.